Early on in Lucy Walker's Waste Land, Vik Muniz stares at some aerial shots of Jardim Gramacho and he marvels at the size of it. Jardim Gramacho is the largest landfill in the world, with 70% of Rio de Janeiro's garbage being transported here daily, but what that aerial view doesn't show us is the people who toil away there day and night. "From above, you don't have any of the human factor," Muniz observes, and the power of Waste Land lies in how close we get to that human factor. 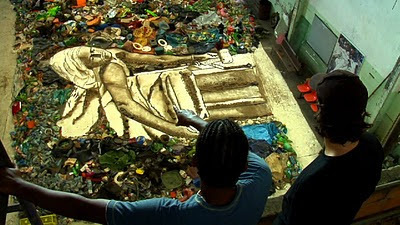 Shot over the course of three years, Waste Land follows Muniz, a renowned Brazilian artist, as he embarks upon an ambitious new project, but it is the "catadores," Jardim Gramacho's garbage pickers, whose stories and experiences provide the film with its considerable emotional impact. They offer surprises too; when Muniz first begins walking around the site with his camera, he is met by smiles and laughter, rather than abject misery. They take great pride in the work they do, considering it good, honest labour, and many of the pickers compare themselves favourably with the drug dealers and prostitutes that they see every day in the favelas. There may be a sharp contrast between the pickers and Muniz, a wealthy and famous artist, but he is capable of striking up an instant sense of trust and rapportwith them, perhaps because he knows what it is to be poor. Muniz talks about the fact that he could easily have ended up working at Jardim Gramacho if he had been less fortunate in life, and now that he has achieved financial security, he wants to give something back. The central narrative thread of Waste Land follows the creation of portraits of the catadores using items retrieved from the dump, but that's not the real focus of the movie. Muniz habitually steps away from the spotlight and both he and Walker seem far more interested in learning more about the characters who participate in the project. We meet Tião, a determined and charismatic individual who dreams of establishing an association to support his fellow catadores; Zumbi, who retrieves discarded books from the dump in the hope of starting a library; Suelem, an 18 year-old with two children who has been working at Jardim Gramacho since she herself was a child; and Isis, the one who touched me most deeply. Isis talks openly and movingly about her tragic life and she is the one who seems to be most affected by the experience of working with Vik, making it clear that she has no desire to return to Jardim Gramacho having had this taste of another life. This is a tricky juncture for Waste Land to negotiate, and one scene shows us Vik and his team sitting down to discuss the ethics of dramatically altering their subjects' lives in such a way; giving them a brief glimpse of an alternative reality before sending them back to their lives at the landfill. "Maybe their minds need to be messed with," Muniz suggests, believing completely in the empowering potential of his project, and the film mostly justifies that belief. We watch these people as they are inspired and moved by their experience, and because Waste Land has involved us so deeply in their lives, we are inspired and moved alongside them. Waste Land is superbly put together by Lucy Walker, who has great storytelling instincts, and its momentum is aided by slick editing and a fine Moby score. It's an uplifting and deeply touching human story, and a stirring celebration of art's ability to transform lives.